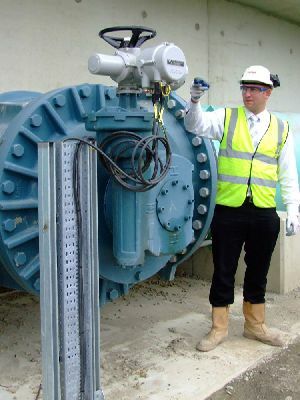 Profibus-enabled Rotork IQPro intelligent electric valve actuators are at the centre of an advanced new treatment process at one of the UK's largest sewage treatment works. A new nitrifying activated sludge plant has been constructed as a major part of an environmental improvement project that ensures compliance with strict new final effluent consent allowances laid down by the European Fresh Water Fish Directive. The scheme involves the introduction of new activated sludge treatment technology to treat the flow from the site’s existing primary works. The new plant is equipped with state-of-the-art controls, condition monitoring and advanced instrumentation to optimise the process and save energy. The efficient performance of the process, which is entirely natural and chemical-free, depends on the injection of re-activated sludge into both sides of the front-end selector plant, in proportions that are dictated by downstream process conditions. These are constantly influenced by circumstances including fluctuating flow levels and ambient weather conditions. Flowmeters and oxygen sensors in the activated sludge plant lanes communicate data to a PLC which then signals positional changes to two Rotork IQPro modulating electric actuators operating 1400mm Dezurik plug valves on a pipe feeding the selector plant from surplus activated sludge storage tanks. The accurate positioning of the two valves determines the flow rates into both sides of the selector plant to ensure that the correct mix is introduced into the activated sludge process. Control and instrumentation communication on the plant utilises a Profibus digital network to provide swift and comprehensive data transmission and economical installed wiring costs. Connectivity with the IQPro actuators is by means of Rotork’s Profibus highway termination module, which enables the bus to be connected and disconnected from the actuators if necessary without interrupting communication with other devices on the network. On completion of the activated sludge process the residual sludge is pumped to final settlement tanks, from where it is thickened and finally used as fuel to generate electricity for the site.